Impact Mapping has taken off in the last few years from its roots in user experience strategy and design, and adopted by small startups and big enterprise software companies alike. The simplicity and effectiveness of the method got the community to experiment with using it in various contexts, from facilitating innovation workshops for new products, to stakeholder alignment in legacy enterprise projects, defining testing strategies, team problem solving, software delivery process improvement, and even organisational improvement on a larger scale. Crossing outside the world of software delivery, practitioners have even applied it to help Egyptian orphanages and Indonesian hospitals. All the recent popularity is providing an immense amount of front-line feedback, and helping to refine and improve the method. At the same time, many different voices advocating slightly different approaches are confusing new practitioners, in particular with the use of impact maps for software product delivery. Ingrid Domingues, Johan Berndtsson and Gojko Adzic met up in July this year to compare the various approaches and community feedback and investigate how to get the most out of this method in different contexts. The conclusion was that there are two key factors to consider for software delivery using impact maps, and recognising the right context is crucial to get the most out of the method. The two important dimensions are the consequences of being wrong (making the the wrong product management decisions) and the ability to make investments. The first dimension, the consequences of being wrong, divides organisations into two groups based on how important it is for product ideas to be validated before they get accepted into delivery. On one end of the scale, building and shipping innovative physical products carries an immense financial risk of wrong product decisions. The PCjr computer is widely regarded as one of the biggest flops in history, costing IBM over half a billion dollars in 1985. On the other end of the scale, online services can today cheaply experiment with product ideas, validating assumptions on real users and significantly bringing down the risk of being wrong. Continuous delivery, staged deployments, A/B testing with immediate feedback make it easy to check ideas and confirm what works and what fails. This was made famous in 2009, in a controversial episode at Google, when proposed design changes were quickly compared to almost forty other options, and proven to potentially cost the company 200 million dollars per year (Google’s top designer quit in response). Several important factors contribute to the risk, including the existence or absence of infrastructure (new product delivery vs enhancing existing services), and type of service or product (security-sensitive, medical and life threatening vs social networks and online games). The second dimension, the ability to make investments, divides organisations into two groups based on how much certainty they need before approving or rejecting a product idea. In the public sector, early-stage startups and when working on innovative product design, budgets are often limited and constrained. It’s difficult to make investment decisions. 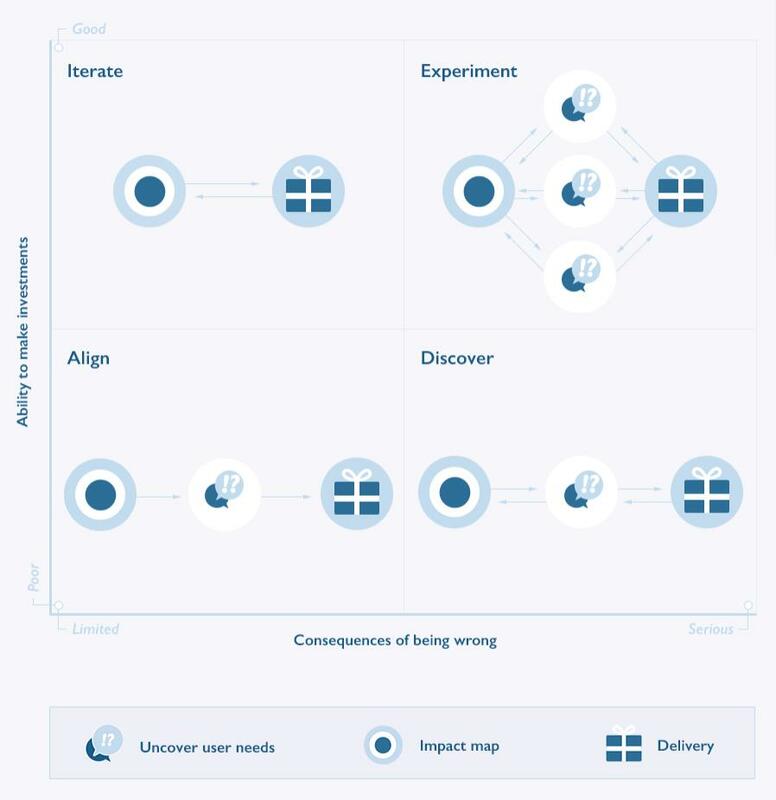 In such situations, impact maps help to facilitate impact management - driving product discovery experiments and ensuring that organisations design, test, refine and deliver product ideas cost-effectively, leading to a clearer product definition before a big investment. On the other end of the scale are established companies with existing products, where the budgets are already allocated and often have to be spent. In such situations, impact maps mostly help spend the budget wisely on initiatives that create the largest impact. The two factors lead to four different ways to explore, define and evaluate impact, thus four different ways for using impact maps. Iterate: good ability to make investments, and small consequences of being wrong. For example, internal enterprise initiatives, or a well-functioning consumer services with an existing infrastructure and ability to deploy small software changes to users incrementally. In such cases, impact maps can help product management visualise assumptions, define desired business impacts and explore user needs. Direct and immediate feedback from the use of the product proves or disproves various ideas cheaply and quickly. Impact maps can help define small milestones, and customer research can be done on a subset of users in a production environment, concurrently with product delivery. Impact maps are effectively short-term product plans, and the feedback from real use drives frequent re-planning and creating new maps through small milestones. In effect, products are continuous prototypes. Teams in this context will do well to start with a rough impact map, and then evolve the map as they iterate through small deliveries. Align: poor ability to decide on investments, small consequences of being wrong. These are typically organisations with many decision makers competing for the same budget or resources, which is often the case in the public sector. Milestones tend to be larger than in the Iterate group, and the challenge tends to be selecting among many different initiatives within the organisation. Impact maps can help define larger milestones, and mainly help teams drive stakeholder alignment and prioritisation. Getting stakeholders together around an impact map helps to choose where to invest effort, so that the entire organisation is driving in the same direction. Teams in this context will do well if they align all stakeholders using an impact map for larger milestones, and use impact maps as a high-level vision for delivery. Experiment: Good ability to make investments, serious consequences of being wrong. Organisations in this context have readily available budgets, but cannot roll out product ideas quickly to end-users. This might be either because of product risk (eg medical devices) or organisational constraints (eg the launch of a new version of the product is set far in the future for marketing reasons and parts cannot be revealed early). Revealing delighters and experimenting around the ocean of possible solutions is key. Impact Maps can help reveal business opportunities, define options and compare different solutions. Teams in this context will do well if they try several options through user research before committing to one solution, and use impact maps to drive product experimentation and determine which variant contributes best to overall organisational goals. Discover: poor ability to make investments, serious consequences of being wrong. This is the zone of innovative physical products, medical devices and initiatives with huge financial risk, but on a limited budget or with difficult investment processes. Running experiments in production isn’t an option, and the need to reveal needs and ensure a design that works in use is crucial. In such situations, organisations should use impact mapping to lead customer research, decide on business impact, evaluate prototypes on test users, and help product managers define scope and solutions for the final product. Initial impact maps aren’t product roadmaps directly, they help to visualise assumptions and run research which will lead to product roadmaps instead. Teams in this context will do well to focus on product discovery and validate impact for users before committing to delivery. Choosing the right approach is crucial in order to get the most out of the method. Iterate. Organisations will benefit from taking some initial time defining the desired impact, and then exploring different solutions with small and directed impact maps that help design and evaluate deliverables against desired outcome. Align. 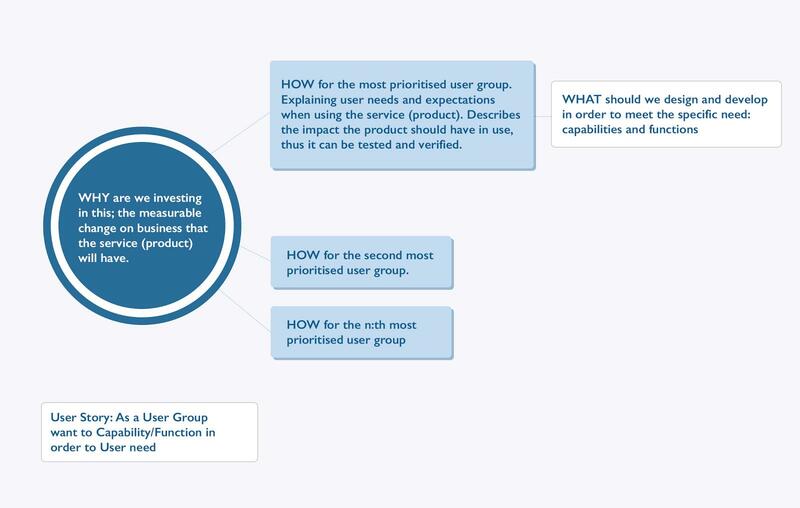 Organisations will benefit from detailing the user needs analysis in order to make more directed decisions, and to drive prioritisation for longer pieces of work. Usually only parts of maps end up being delivered. Experiment. Organisations can explore different product options and user needs in multiple impact maps. Discover. The initial hypothesis impact map is detailed by user studies and user testing that converge towards the desired impact. Impact mapping is a strategic planning and visualisation technique with roots in user experience strategy and design. An impact map visually connects solution ideas (deliverables, such as user stories) to business goals through impacts on stakeholders and customer segments. By putting deliverables into perspective of user needs and behaviour changes, and putting user needs into the perspective of overall organisational objectives, an impact map visualises assumptions. This helps to create a big picture for software delivery and facilitates many good product management techniques, such as customer research and iterative planning, as well as helping stakeholders align and prioritise iterative delivery. The first paper on impact mapping was published in 2002 by Domingues and Berndtsson et al. Using impact maps for IT projects was described in the 2004 book Effektstyrning av IT (Swedish) and the 2007 book Effect Managing IT (out of print). In Sweden, Impact Mapping and Management caught on fast and is today widely used within software and development. Impact Mapping crossed over to the agile software delivery at the start of the decade, and the agile software development community helped to spread the word about the method at some of the most important conferences in the US, Europe and Oceania, to informal meetups all over the world, including Australia and Japan. The agile delivery aspect of Impact Mapping was described by Gojko Adzic in the 2012 book Impact Mapping, which was recently translated to Chinese and Japanese. Gojko Adzic is a strategic software delivery consultant who works with ambitious teams to improve the quality of their software products and processes. Gojko’s book Specification by Example was awarded the #2 spot on the top 100 agile books for 2012 and won the Jolt Award for the best book of 2012. In 2011, he was voted by peers as the most influential agile testing professional, and his blog won the UK agile award for the best online publication in 2010. Gojko's latest book is Fifty Quick Ideas to Improve Your User Stories. Ingrid Domingues is the woman behind Impact Mapping and Impact Management, and the author of several books on the subject. She has spent more than two decades designing digital experiences, and her speciality is defining needs and metrics. Ingrid is also one of the founders of one of Scandinavia's leading UX agencies, inUse. Johan Berndtsson is a co-creator of Impact Mapping and Impact Management, and the co-author of one of Sweden’s best-selling UX books. He has worked with UX since the mid-90s, and has designed everything from top-rated mobile apps and web sites to cash registers and air traffic control systems. Johan is also one of the founders of one of Scandinavia's leading UX agencies, inUse.